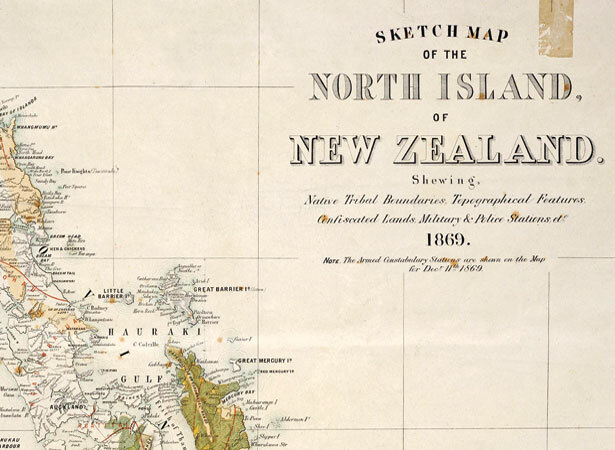 Parliament passed legislation for the confiscation (raupatu) of Māori land to punish tribes deemed to have ‘engaged in open rebellion against Her Majesty’s authority’ in the early 1860s. Pākehā settlers would occupy the confiscated land. On the eve of the British invasion of Waikato in July 1863 (see 12 July), the government ordered all Māori living in the Manukau district and on the Waikato frontier north of the Mangatāwhiri stream to take an oath of allegiance to the Queen and give up their weapons. Those who refused were warned that they would ‘forfeit the right to the possession of their lands guaranteed to them by the Treaty of Waitangi’. Under the New Zealand Settlements Act, Waikato lost almost all their land and Ngāti Hauā about a third of theirs. But kūpapa (pro-government or neutral) Māori also lost land as the yardstick rapidly changed from guilt to convenience. Ngāti Maniapoto territory was untouched as it was still under Kīngitanga control. In the long term, Taranaki Māori suffered most from confiscation in terms of land actually occupied. We have 3 biographies, 3 articles, related to Land confiscation law passed.